› Author Affiliations Funding Statement M.G.H. and J.B. are supported by NHMRC Early Career Fellowships and Career Development Fellowships and L.J.M. is supported by a National Heart Foundation of Australia Future Leader Fellowship. J.B. does consultancy work for JHF and M.G.H. has previously been employed by JH; J.B., M.G.H., and L.J.M. have previously contributed to the preparation of JH website material and J.B., M.G.H., N.S., L.J.M., and S.C. have all contributed to the Australian National Evidence-Based PCOS guidelines. 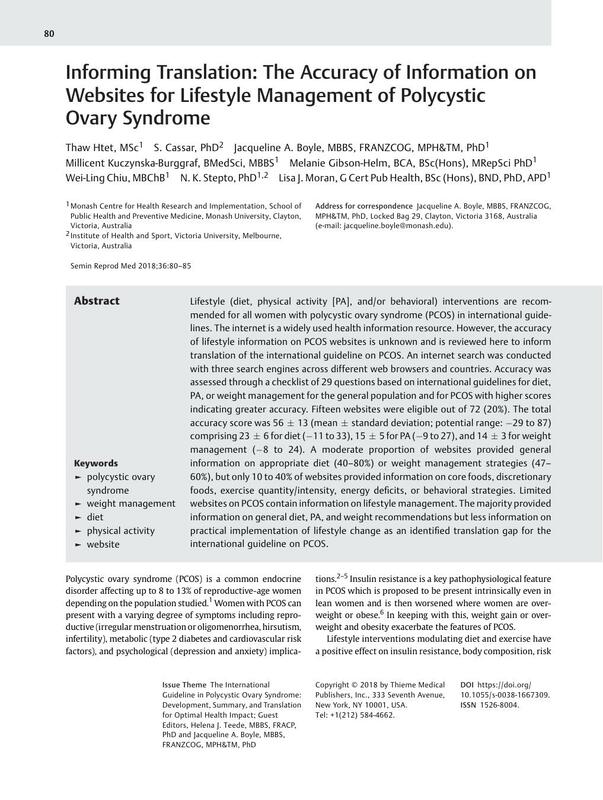 Lifestyle (diet, physical activity [PA], and/or behavioral) interventions are recommended for all women with polycystic ovary syndrome (PCOS) in international guidelines. The internet is a widely used health information resource. However, the accuracy of lifestyle information on PCOS websites is unknown and is reviewed here to inform translation of the international guideline on PCOS. An internet search was conducted with three search engines across different web browsers and countries. Accuracy was assessed through a checklist of 29 questions based on international guidelines for diet, PA, or weight management for the general population and for PCOS with higher scores indicating greater accuracy. Fifteen websites were eligible out of 72 (20%). The total accuracy score was 56 ± 13 (mean ± standard deviation; potential range: −29 to 87) comprising 23 ± 6 for diet (−11 to 33), 15 ± 5 for PA (−9 to 27), and 14 ± 3 for weight management (−8 to 24). A moderate proportion of websites provided general information on appropriate diet (40–80%) or weight management strategies (47–60%), but only 10 to 40% of websites provided information on core foods, discretionary foods, exercise quantity/intensity, energy deficits, or behavioral strategies. Limited websites on PCOS contain information on lifestyle management. The majority provided information on general diet, PA, and weight recommendations but less information on practical implementation of lifestyle change as an identified translation gap for the international guideline on PCOS.